← Earned Consumption Recession. Bond Decoupling And Debt Fragility. The banking system has now become a Colossus. The “narrow world” of finance has come to be almost completely dominated by the banking system and its imperatives, and this now seems to include what used to be termed “markets”. Ever more powerful and in control, bank influence is accelerating towards its inevitable endgame, seemingly oblivious to the fatal flaws in its systemic composition. The “more, now” incentives apparently overwhelm any concern for its obvious unsustainability and insensitivity. The ever shrinking options for “we petty men”, provide a puzzle that nonetheless must be resolved for financial survival. Just the starting point for resilience is to separate out economic reality from the machinations of the banking system. Then it is becoming crucial to understand the nature of the fast approaching reset as the current system disintegrates from its own unresolvable contradictions. “Market” behavior, at this point has become almost completely transformed. As shown below the fundamental links between economic data and prices are not only breaking down, in some cases they are even being completely reversed. This does not mean that there is no explanation for what is happening. Far from it. It just means that a new rationale, outlined below, has become overwhelmingly dominant. This changed environment is extremely high risk as fundamental relationships will inevitably return, but from a place of vast distortion and despite the will of the current Colossus. So what are the observable differences in markets that are clearly departing from normal fundamental relationships? Does the banking system benefit from these new developments? What about “we petty men”? Where is all this going? 1. The only comparable collapse in the Bloomberg Macro economic data over the last several months was during the 2008 implosion. 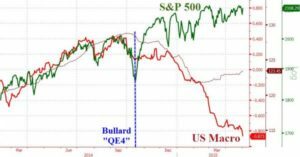 Usually there is a tight relationship between this indicator and the S&P 500. However, this relationship has completely broken down as it is easy to see. 2. The chart shown here shows the almost complete current disconnect between 10 year Treasury bonds and Fed Fund futures. Historically this degree of disconnect has never been seen before. 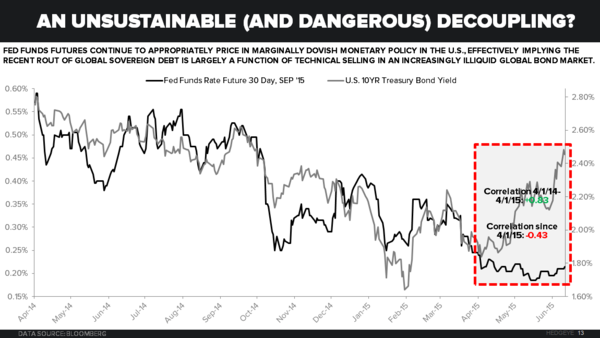 Bond yields have risen dramatically despite very stable Fed Fund futures. Furthermore, Treasury bond yields rarely rise at all when Macro Economic data is in steep decline as shown above. 3. This chart shows the strength of the recent rise in the US dollar. One of the strongest rallies of recent decades. Together with higher bond yields, a stronger dollar is a further constraint on economic growth even as macro data is weakening rapidly. 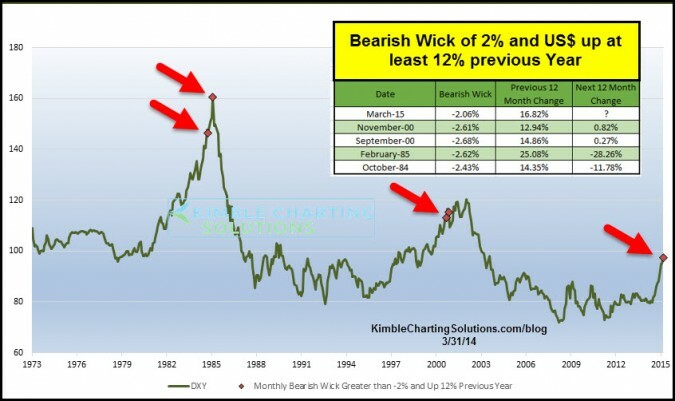 This chart also shows a pattern that in the past has led to a reversal in the direction of the dollar. Does all this benefit the banks? You bet! Hugely and at every turn. First of all, higher stock prices obviously increase the bank’s main currency and remunerations. For this reason stock prices need to be kept high and rising. A collapse in economic growth should not be allowed to alter this any more. Check. However, why stop there? To reinforce stocks in particular they need to outperform other asset classes. A strong dollar takes care of most commodities and overseas stocks. Check. Next to boost actual core bank earnings (net interest margin) a steeper yield curve would help. As lending long and borrowing short can be leveraged 10 times and far beyond, higher bond yields, but still low short term rates can steepen the curve as shown above and transform profitability dramatically for the better. Check. How can all these shifts happen so only a few people notice, while the great majority even believe it’s all good? Persistently send out the message that policy is working well, growth is picking up, so that’s why stocks are up, US dollar is up and interest rate rises are just around the corner, but not just quite yet. That should work for at least 6 years. Check. This is why the current system has increasingly become a system of Financial Repression. While the banks increase control and rewards, investors increasingly suffer if they diversify away from controlling stocks that have ever higher valuations. They also receive a zero risk free return. Then if they borrow, costs continue to rise as the yield curve steepens! Banks win every time, but at a cost to everyone else. Indeed, there seems to be a growing realization that overgrown financial service sectors kill growth. Meanwhile, the real economic feedback loops are still functioning and the economy continues to fail to deliver. This means that the new distortions continue to widen relative to fundamentals. So, while the Colossus won’t change its ways, the disconnect is accelerating, the endgame rapidly comes into view, and so the risks of a reset are rising too. 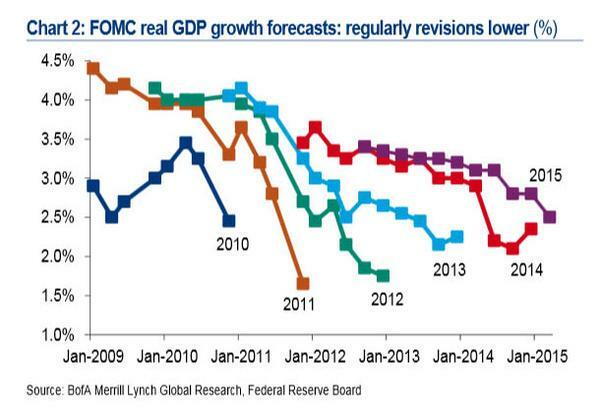 The header chart shows that the Fed has overestimated growth every year for the last 5 years. True to form, in this week’s Fed meeting, growth was once again downgraded, this time to around 2% for 2015. This is most likely still too high, but nevertheless, even now, it represents a sequential decline from last year. The weakest “recovery” since the 1930s is now already one of the longest and so this year’s severe downturn in Macro data, together with other late cycle signs suggest that forestalling a recession is going to be an increasing challenge. 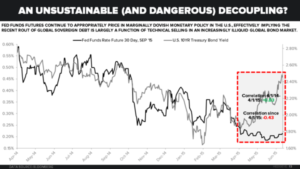 As described above the current weakness comes with an actual tightening of policy through higher bond yields, the threat of Fed rate increases and a stronger currency! This is all in the context of a steep decline in world growth. Maintaining an asset bubble of this proportion is getting increasingly difficult as well as extremely dangerous. 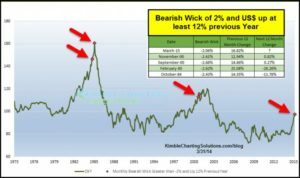 As we have shown before expected long term investment returns at current valuations are unattractive at best, which leaves either trading a rigged market in the short term or taking a longer term more cautious stance, or some mixture of the two. Increasingly, caution is becoming far more advisable. Investors need to be fully aware of the game they find themselves in. This is increasingly a time to focus less on short term returns and far more on structural long term resilient strategies. Major investment opportunities will return as soon as the banking Colossus losses control. Until then it may be better to avoid short term volatility and focus on the endgames that are increasingly predictable almost to the point of inevitability. This is when opportunity and reward will return in spades. “What I find fascinating is our limited ability to make sense of trends unfolding in real time … then we must conclude the speeding up of change is eroding our ability to make sense of present-day trends, as the velocity of change is outrunning our ability to construct coherent narratives. But just as a parlor game, let’s ask: are there three modern-day equivalents of consciousness 1, 2 and 3? 1. Those who still believe the Status Quo narratives of meritocracy, a just central state, the market can solve everything and whatever it can’t solve, the central state can, etc.